The first JDRF Flying With Diabetes Day was held at White Waltham Airfield, Maidenhead, on 17th September; a very enjoyable afternoon with twenty four people in total. Douglas Cairns, Karl Beetson, George Duncan and Kathryn Robertson gave talks about piloting and flying projects with type 1 diabetes, including a recent flight to the North Pole, a 14-hour Vans RV8 flight around Britain, ballooning across the English Channel and planned gyrocopter flight around Britain's coast respectively. A draw was held for 6 flights given by Douglas and George in a RV8 and PA-28 – luckily we flew in between the worst of heavy rain showers and the odd thunderstorm that (conveniently!) by-passed White Waltham. We also were delighted to receive a donation of £500 to JDRF from Frans Luijendijk of MyDiabetesDigital magazine. We look forward to holding more JDRF Flying With Diabetes Days in 2012 – we'll keep you posted on details of these events in the New Year. This was our first UK speed record attempt; a 14-hour & 17-minute whirlwind 3,500 km flight around Britain's coastline between dawn and dusk in a tiny Vans RV8 two-seater single-engine aircraft. It was an early 5.30 a.m. start from Dunsfold Aerodrome, Surrey, from where we flew to Worthing Pier for Emanuel Carriero to witness the start (a huge thanks to Emanuel for doing this plus officially witnessing the finish). With a low pressure system spinning off the far north west coast of Scotland, we set off east to Land's End on a clockwise route, seeking out south westerly tailwinds up the west coast, and weaker headwinds/possibly tailwinds down the east coast. Much to our pleasure (and relief) this plan worked well along with five very quick refuelling stops - Cardiff, Carlisle, Stornoway, Kirkwall and Durham-Teesside Airports. Huge thanks go to each airport (including the Club at Southside, Cardiff Airport, and Teesside's Western handling services) who expedited refuelling - a vital component of this dawn to dusk flight. A huge thanks also goes to Dunsfold Aerodrome for hosting us the night before and facilitating a very early start. It was such a terrific way to see our beautiful country; low-flying along Devon's coastline, Wales' lush countryside, over (thought-provoking) water across to the Outer Hebrides and around the far north of Scotland. Strong crosswinds made for a bouncy landing at Stornoway, and yet just an hour later we were in beautifully peaceful conditions over the Orkney Islands. Much of the flight was spent below 2,000 feet with clouds keeping us low around England's south coast until mid-Wales, after which sunny spells dominated, and it was good to watch heavy rain showers move eastwards and away from our course as we progressed north towards Cumbria and Scotland. Also en-route we were very grateful for London & Scottish Information plus a number of airports giving basic air traffic services en-route. It was definitely good being in radio contact as we flew over open water between Scotland's western Isles. Meantime the RV8 coped admirably with squeezing two life rafts plus other survival equipment & food and liquids into limited space, as she cruised at an average speed of around 180 mph. Another factor that worked extremely well was splitting the flying between the two of us, and with Karl also stamping away on his iPAD for weather and GPS information while en-route. 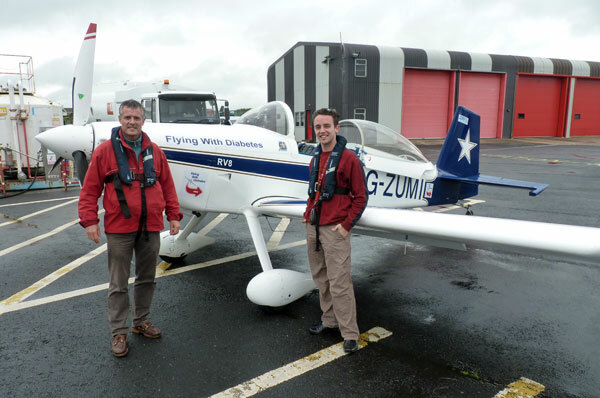 Overall it was a very enjoyable if not gruelling record attempt as we made our way around, and a good endurance flight to do here in the UK to help demonstrate how well the system for flying with diabetes works. Once again hourly blood sugar tests become an integral part of regular cockpit checks while continuous glucose monitoring helped give us a clear picture of where blood sugars are trending and take action accordingly.